Big D’s Grub Is Excellent. Really Excellent. Among The Best Truck Fare. Welcome to Big D's. Korean Taco goodness lies within. It’s been a while since I could write about a place that was a clear win, but based on the lunch I just got from Big D’s Grub, get ready for a rave. First of all, let me announce my bias. Longtime readers of the blog will know of my often-confessed love for Korean BBQ, let alone Korean tacos. So read the rest of this with that firmly in mind. 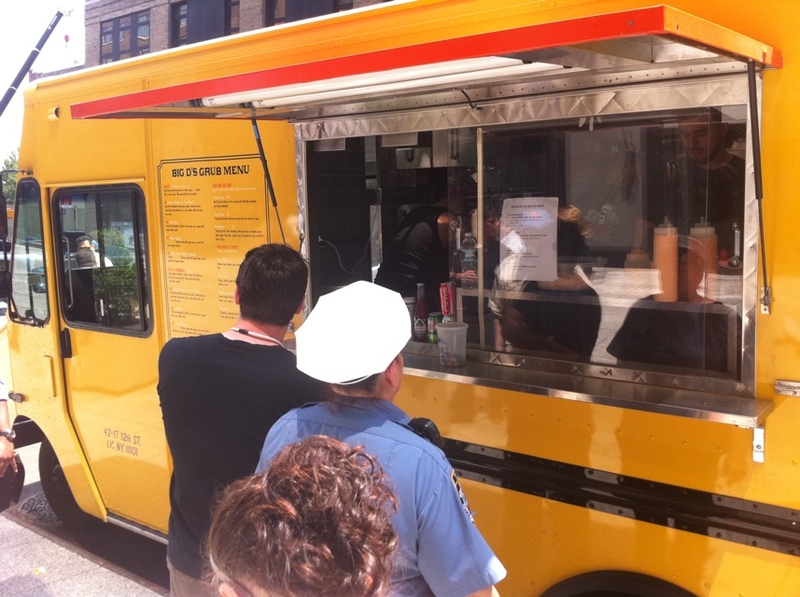 If Korean food isn’t your thing, well… you’ll still love this truck. 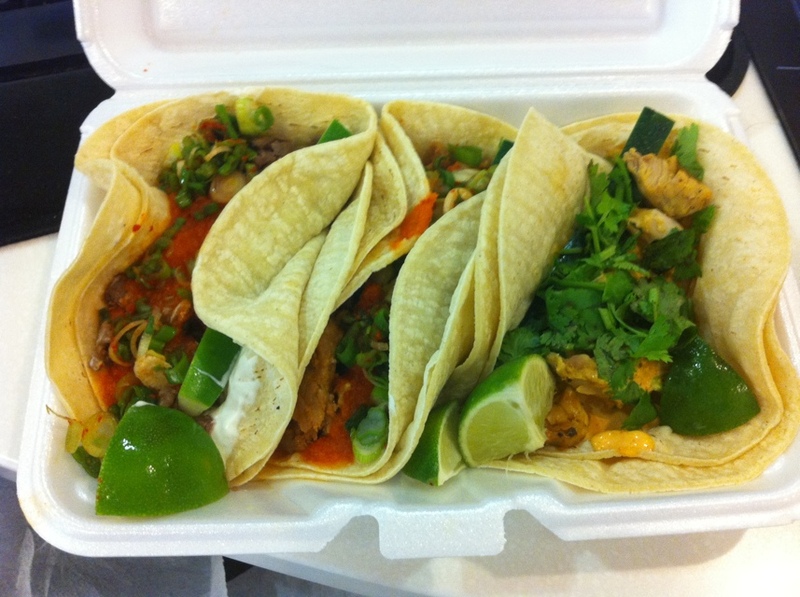 For just $7, you get three filling, flavorful Korean tacos. I am pleased to report they are easily among the best I’ve had in the genre, trouncing offerings from Bann Next Door, Korilla and I’m afraid even the Kimchi Taco Truck. They are fresh, delicious, copious, flavorful and just generally awesome. That's a hefty portion. Bonus: check out those lime wedges. First of all, consider the price point against the volume of food. As you can see above, the trio of tacos isn’t exactly small. It leans toward the heftier side without being too overwhelming. So it has some bulk to it, which is good. What you’re looking at above was the suggestion of Dennis, the owner/operator of the truck. From left to right above, you have beef, spicy pork and spicy chicken. We’ll take them one at a time. What is that curious white glob doing on the beef? Being awesome. 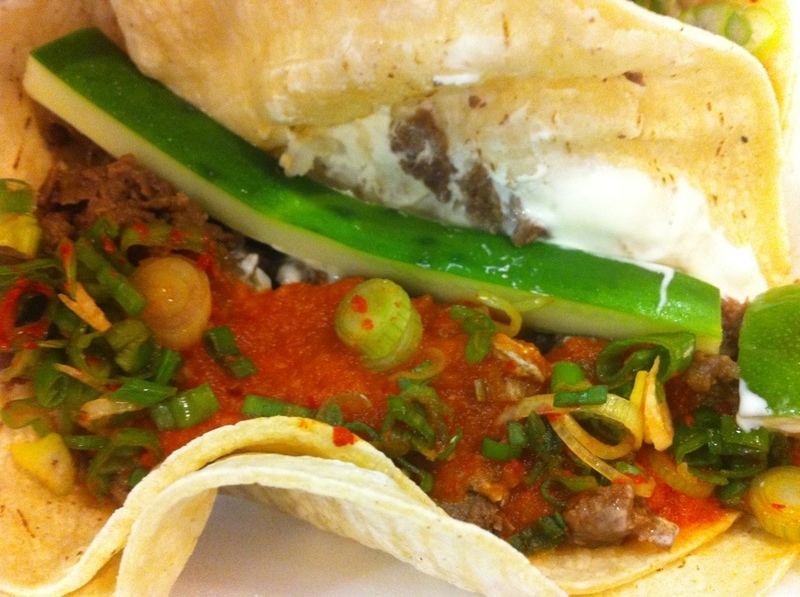 The Bulgogi taco above is beef, soy sauce, garlic, sesame seed oil, kimchi, scallion and from out of nowhere comes a wildly inspired crema. The crema is fairly substantial, adding a significant fat and cool to the otherwise lean beef. Of course, the tortilla adds another fat flavor as well. The kimchi’s spicy, pickled note is also present without being overwhelming. The taco itself had a surprisingly sizzle, spice-wise, without being too much. That said, it is spicier than some of the other taco trucks out there. Squeezing the fresh lime over it was wonderful and added the expected citrus palette cleanser. 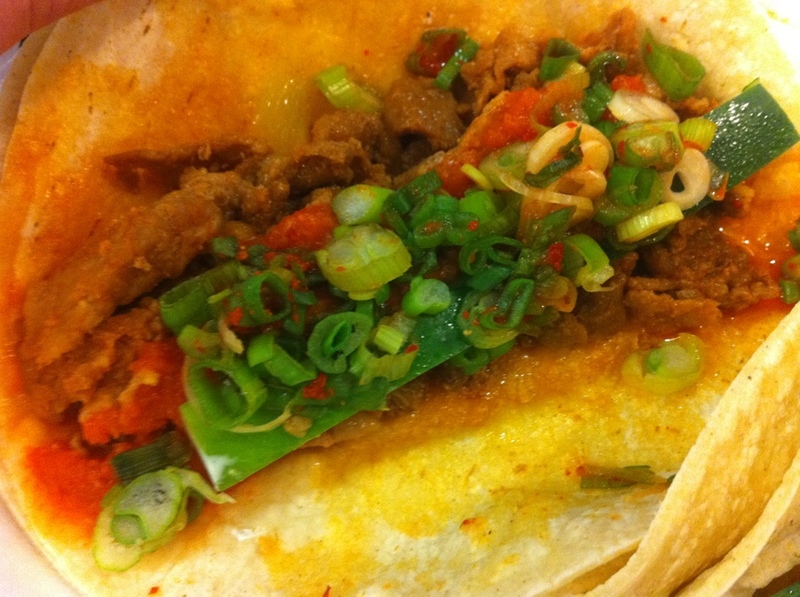 Between the heft of the beef, the crema, the lime and the kimchi – there was a lot going on. I should add that the slice of pickled daikon (?) adds some welcome crunch to the experience. Big chunks of pork there, unlike the thinner pieces of beef. 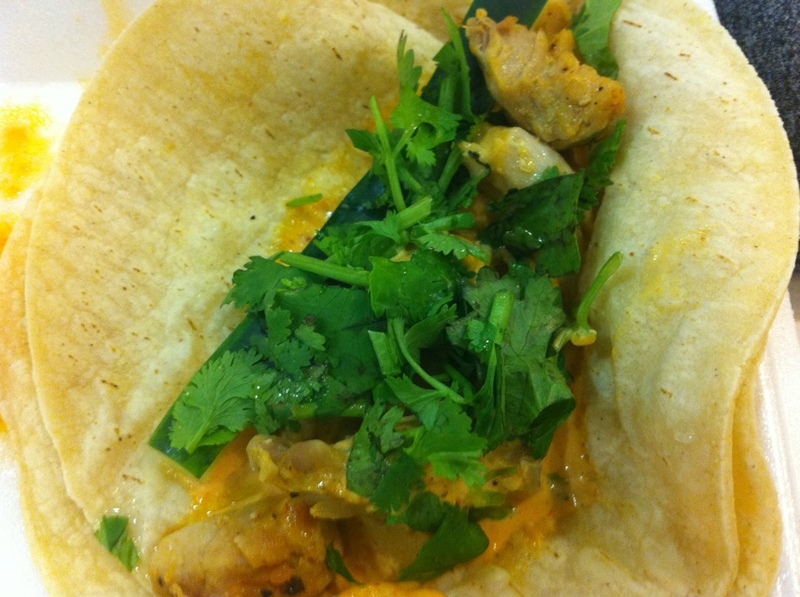 As much as I enjoyed the beef taco, I was even more pleased by the pork. As you might expect, the pork has a sweeter flavor than the beef. It is marinated in a spicy sauce before a kimchi puree is added. The scallions on top round it out. It too was delicious. However, the best was yet to come. Chicken? The star of the show? Yes. I was astonished that the chicken should be my favorite of the three. Considering how many burgers and steaks I eat, you probably recognize me for the lover of beef that I am. I generally think of chicken as an “also ran” in these types of dishes. Wrong. This was absolutely delicious. It’s tender, chunky and comes in this awesome orange spicy mayo. Cilantro is liberally sprinkled across the top. The mayo adds a fatty heft, the spice sizzles a bit on the tail end. All in all I was completely wowed by my lunch. For $7 I had three terrific taste experiences that left me well filled up. It’s the best overall truck fare I’ve had since Taim (perhaps the Red Hook Lobster Pound’s Big Red deserves a mention here too). If you see it, get it, you won’t regret it. Compared to the other trucks, Big D’s Grub is now the one to beat. Travels around the city, check their website for more information or follow them on Twitter.